LIMA & CUSCO, Peru – If the llama and alpaca are animals most often associated with Peru, then Cusco Region’s unofficial mascot must be the dog. The homeless dog. The wandering, neglected, unloved dog. But strangely, not necessarily the starving dog. Wherever we travel in Cusco, whether the big city itself or smaller towns high in the Andes Mountains – even at the famous site of Machu Picchu! – such wretched dogs roam the streets, in need of a bath and a proper, loving home. To my immense surprise, though, most of them look reasonably well fed. At the very least, they aren’t the typical skin-and-bone kind of animal you expect to see under such circumstances. I’m at a loss to understand this paradox, so, I ask Layla Aucca Zuniga, a native Peruvian and passionate animal welfare advocate, as we drive through one of the poorer sections of Cusco City. 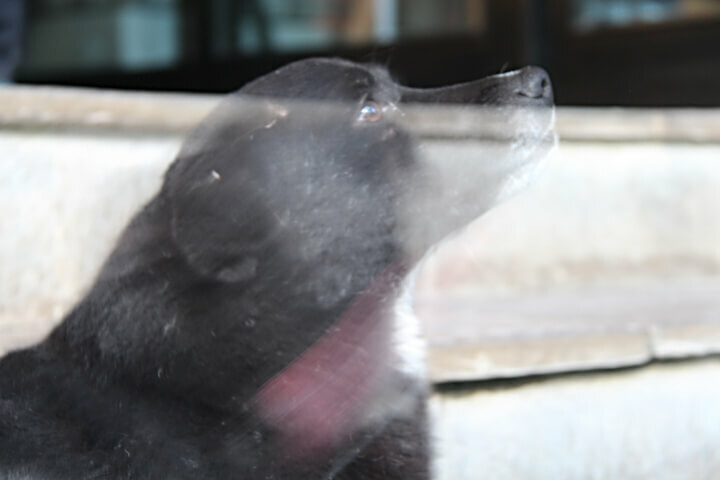 It seems even more bizarre, then, that almost none of the street dogs we encounter in Cusco wear a collar. While we don’t see nearly as many homeless cats wandering the streets, Mauricio Guevara insists they are as much of a concern as the dogs, and for similar reasons. “We just don’t see them because they tend to hide during the day,” says Mauricio, who’s joining us on our drive to the Pataz animal shelter in Cusco. Like Layla, Mauricio is dedicated to saving animals, so much so that he recently founded his own charity, Perú Animal Rescue. There is, however, reason to be hopeful for Peru’s future. To a newcomer, Peru’s capital seems perpetually enveloped in grey fog and haze. Locals will attest that this is literally true only half the year. And occasionally, blotches of blue sky manage to poke through the gloomy mist. If Lima’s general weather pattern can serve as a metaphor for Peru’s current overall animal welfare situation, then the nation’s capital is that occasional promising patch of blue. 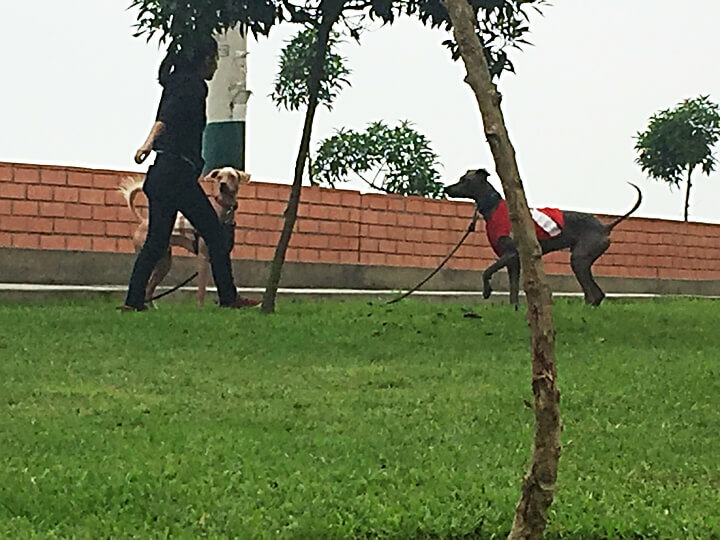 On a typical June morning, many dogs walk Lima’s streets. These lucky animals, though, are attached to leashes and accompanied by their loving owners. Their destination is Parque Domodossola in fashionable Miraflores, one of Lima’s 43 distinct neighborhoods, or municipalidades. 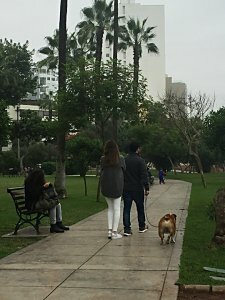 This park is among the numerous green spaces lining Lima’s long Pacific coastline and a popular gathering point for Miraflores residents. Here, they meet for outdoor yoga classes, casual strolls, bike rides, and to enjoy the spectacular views of the ocean from high atop the floral cliffs. Amid all this, dogs are welcome. They are a natural element of the mise en scène, in fact. Single people walk their dogs here and often stop to play a game of fetch. Couples promenade arm-in-arm with their furry companions alongside. Families and friends gather to spend quality time and let their dogs run freely. One morning, I even see a professional dog walker escorting 14 leashed dogs – seven on each arm. 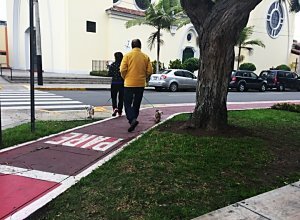 The colorful Barranco municipalidad in Lima is home to many pet-friendly families, individuals, and businesses. In neighboring municipalidades like Barranco, a haven for creative, artistic Limeños, and San Isidro, home to one of the world’s greatest restaurants (Astrid y Gastón), it is much the same. Throughout this vibrant city, the fourth-largest in South America, I spot a number of inviting, brightly-colored veterinary clinics and pet-grooming establishments. 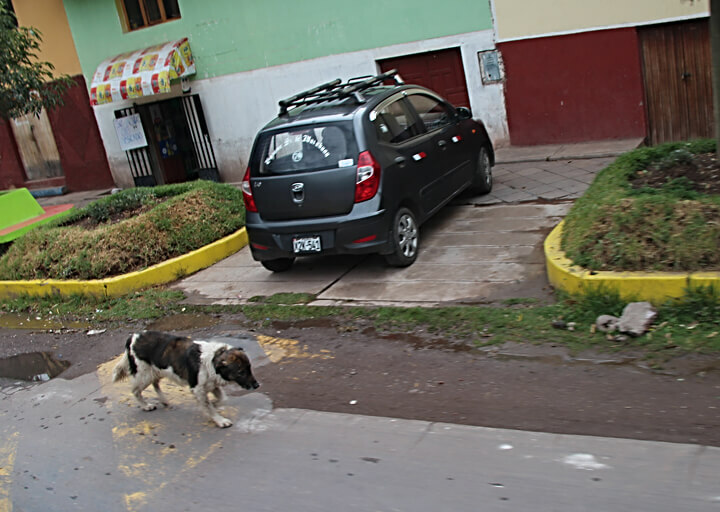 There are still some stray dogs and cats, but compared to Cusco, the problem appears not to be nearly as widespread. Pets are pampered here. Lima therefore serves as both a relatively harmonious setting for animals and a vision of the kind of future that compassionate, forward-thinking Peruvians like Layla and Mauricio hope to create. In Peru, they both believe, animal welfare is a cultural conundrum that will take time, perhaps a generation or more, and effort to solve. For the time being, Mauricio and Layla are doing what they can to be positive examples. Both grew up with animals in their families and are still proud dog and cat owners today. Though they are now also colleagues at luxury travel company Abercrombie & Kent, they say they might never have discovered their shared love of animals were it not for Nutmeg Animal Welfare’s serendipitous intercession. Traveling with A&K, Nutmeg frequently utilizes the company’s vast, worldwide network and resources to identify areas where animal welfare is neediest. 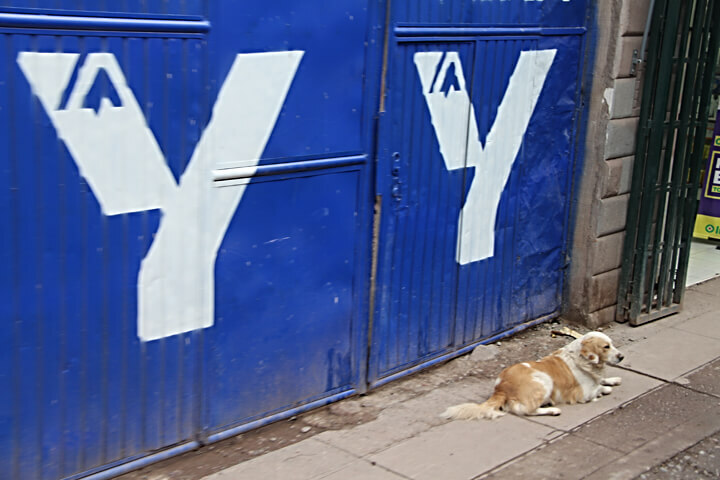 In Peru, that happened to be in Cusco, at the Pataz shelter, which we profiled in a previous post. Layla was originally assigned to accompany us on our visit to Pataz. When the day came, she was joined by Mauricio, who was in his first week on the job and training under Layla. Turns out, Mauricio had long known Monica Chacon, the woman who founded and runs Pataz, so the opportunity to tag along proved beneficial for everyone. Mauricio helped make the introduction and provide translation assistance along with Layla. Meanwhile, Layla is also regularly involved in another A&K Philanthropy project. 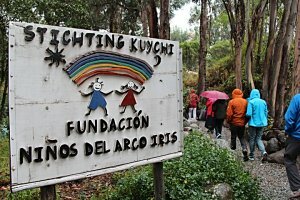 As part of most A&K itineraries in Peru, travelers are taken to Niños del Arco Iris (Children of the Rainbow), an elementary school for children of the many underprivileged families in the Andes Mountains of Cusco Region. There, to strengthen both their minds and bodies, the youngsters receive daily prepared meals and routine medical care in addition to their modern classroom education and outdoor physical activities. Since one of Nutmeg’s founding principles is to foster animal welfare education around the world, this encounter in Peru might be the catalyst for our first such formal endeavor. We’re thrilled to have helped make this connection and are committed to staying in contact with Layla, Mauricio, and our other new Peruvian firends to continue discussing ways to develop this animal welfare education initiative. Nutmeg also plans to provide whatever material assistance we can to help cultivate the program. Please enter a dollar amount to donate to Nutmeg Animal Welfare.